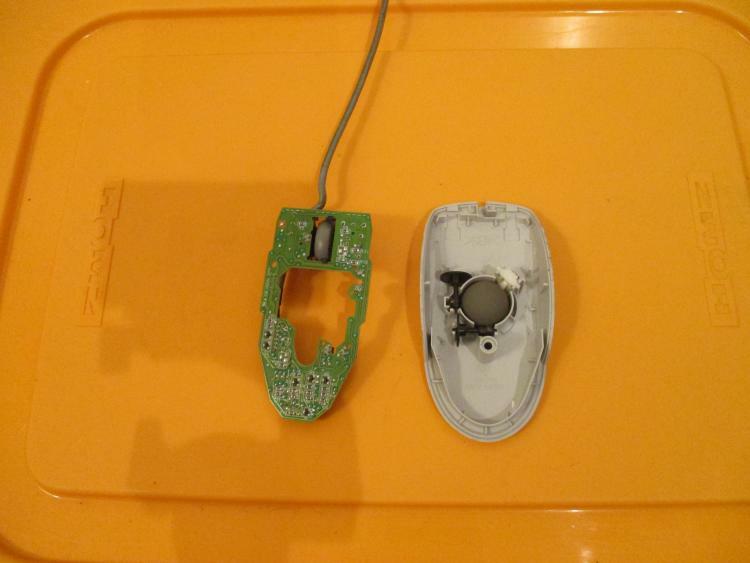 The easiest way to start out is to remove the circuit board from a mechanical mouse and place it far away, so that only the wires for the buttons and motion sensors have to pass close to your hand. This is a great idea. I didn't even think of that. Too much EMF in the head. This could make a big difference. Will be very interesting to see! It may even be within the realm of most people's ability to DIY, or with the help of a few spare parts. Like a mouse mod kit. Marc, do you think that the problem is with the mouse itself, or could it be the USB interface on the computer? I think so. The electrical changes are pretty simple. There are two parts that need to be aligned closely, but using the old circuit board as a template is probably good enough. Karl., it's just that USB and PS/2 work differently. USB is constantly polling, repeatedly asking if something has changed. So you're getting hit by frequencies even when the mouse (or keyboard) is doing nothing. PS/2 on the other hand, only kicks in if something has happened -- you move the mouse, or press a key. Also USB is on a shared bus with other stuff, so more chance of contamination. While PS/2 typically just has two dedicated ports, one for the keyboard and one for the mouse. I've tried using my usually tolerable PS/2 mouse connected to a PS/2 to USB adapter, and then plugged into a USB port on a PC, and the mouse was intolerable under these circumstances. Then back to the using the PS/2 port, it's perfectly fine. Although this could have been the adapter causing the problem. Also USB is on a shared bus with other stuff, so more chance of contamination. I don't have a PS/2 port on my computer, but using an AM radio it's easy to confirm this power contamination theory of the USB bus. I get more noise on the mouse simply by taxing the CPU of the computer. It's clearly propagating through the power distribution. The amount of noise that is propagating makes it seem a small wonder the whole thing works at all. In hindsight it was kind of silly to ask what interface to use because that won't matter as long as the project works. I just compared my oldest Chicony keyboard to the USB version of the same model (which I've added shielding to), and it does seem to make less high frequency noise on the AM radio. I'll need to do a fair comparison (shielding on the PS/2 keyboard or no shielding on the USB keyboard) to know whether it's quieter overall, but I think it's not. It feels better to type on it, though. The newer version of that Chicony PS/2 keyboard has the same model number but a different controller inside. It doesn't feel any better to type on than the USB version. I don't have the right mice to do a fair comparison - just mechanical PS/2 mice and optical USB mice. 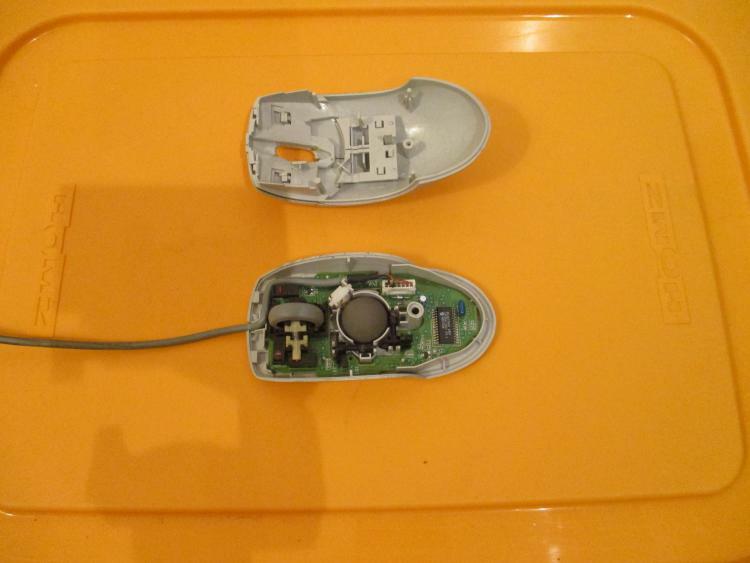 Some of the old Logitech mice are very easy to disassemble and are also pretty well-built, so they might be a good base for the project. Another option would be to go with something ubiquitous like an Intellimouse. > option would be to go with something ubiquitous like an Intellimouse. BTW, the mice that I use and label as "perfectly tolerable" are the old Microsoft 1990s Intellimouse (PS/2, mechanical/ball, scroll wheel, 2-button). They did make USB versions of these mice during the transition from PS/2 to USB, but as long as I have a PC that supports PS/2, I'll continue to use the PS/2 version. It comes apart easily with just one screw. There are 14 pins that would need to be de-soldered to remove the motion sensors, and the scroll wheel would be slightly more complex if you want to preserve its ability to function as a second button. The motherboard I linked to earlier has the necessary interface built in, as do a few others. Some will run directly from a battery if desired. They still sell PCs with PS/2 ports, and also if you purchase desktop tower computers (as I do), you should be able to add PS/2 ports via a PCI expansion slot. So it is still a viable solution for now. I was concerned that a PCI card would have the same problems as a USB keyboard/mouse - it shares power with all other PCI devices (including ethernet controllers built into the motherboard). PCI also doesn't provide the right voltage for PS/2, so the cards might have a switching voltage regulator. I don't know, though; sometimes things that 'should' be good end up causing trouble. A PS/2 motherboard is probably as clean as the computer's power supply. What I liked about the Arduino interface is that it would be fairly easy (and cheap) to use a separate clean power supply for the mouse and keyboard. Sailplane told me that he tried to do that with USB and found that his computer wouldn't recognize the devices anymore. Doing it with optical USB is supposed to work, but it's expensive. I haven't tried it with PS/2.